I decided on a little flirty double ruffle slip for now. and they are not made out of drop cloths this time. it was instant love when I found them at the grocery store. Courtney, I adore the ruffled slip and those are the prettiest roses I believe I have ever seen. I wish they had those in my store. Oh my is right! 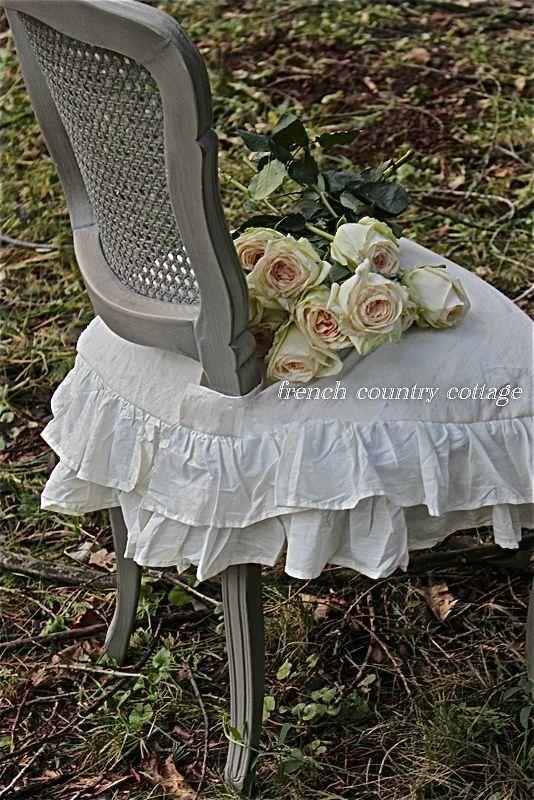 I LOVE the double ruffles and these chairs are so Shabby Chic. The flowers are a perfect addition (not to mention that chippy white table behind). You have such a flair for vignettes Courtney! They are very young, fresh, and flirty. Good job! 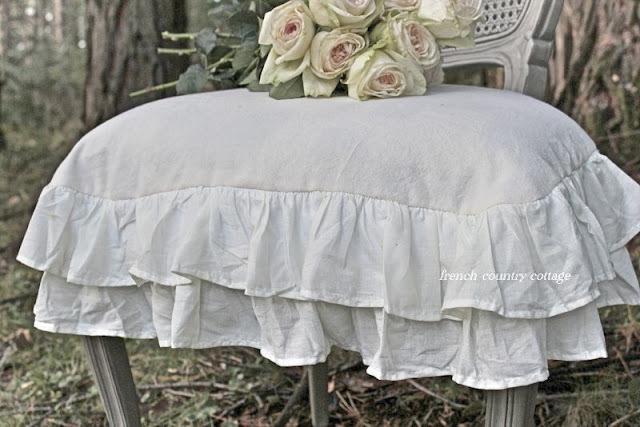 I love the ruffled chair covers and would like to do something similar for my dining chairs. Did you add a cushion underneath to give it that soft look, or do the chairs have a thick, soft cushion already? Well, I'm loving them too! I can't believe you found those beautiful roses at a grocery store. They look too unique to be found there. You did such a great job with your chair skirts. I like those better than what you were going to originally do with them. Wish I could sew like that! you really know your roses and ruffles, this is beautiful!! The chairs and the ruffled seats are so pretty. You did a wonderful jobs. Loving the ruffles... and the roses! Beautiful! Especially love the roses in the photographs! Brightens my day! Yes they are wonderful Courtney!! love the slips and those roses. So very pretty Courtney! I love the slip cover! Those roses (and chairs) are gorgeous! Just happened onto your blog, and will definitely be back now that I'm following you. I'm working on a cottage remodel of my own, and once all the building stuff is done, will be able to start decorating. I am sooo loving your ruffled chairs! What is the material you used? The roses are just perfect, I am dreaming of spring! White and ruffles, a beautiful combination! Love the double ruffled chair cover--I think it looks so much better than if you re-did the upholstery! Reminds me I have 3 more to do at my house:) Though I like what you have done with the drop cloths in the past I like the more soft effect of this one. Have a great week! So gorgeous as usual Courtney...you never disappoint!! so romanic, so beautiful! 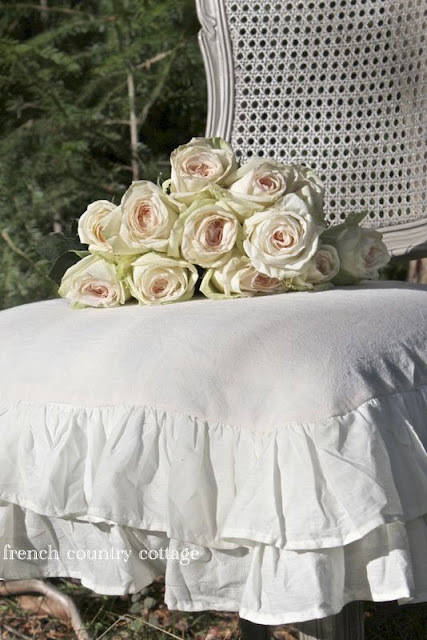 love your slipcover and the roses are darling! Such a pretty slip cover - loving the double ruffles! So romantic and feminine. 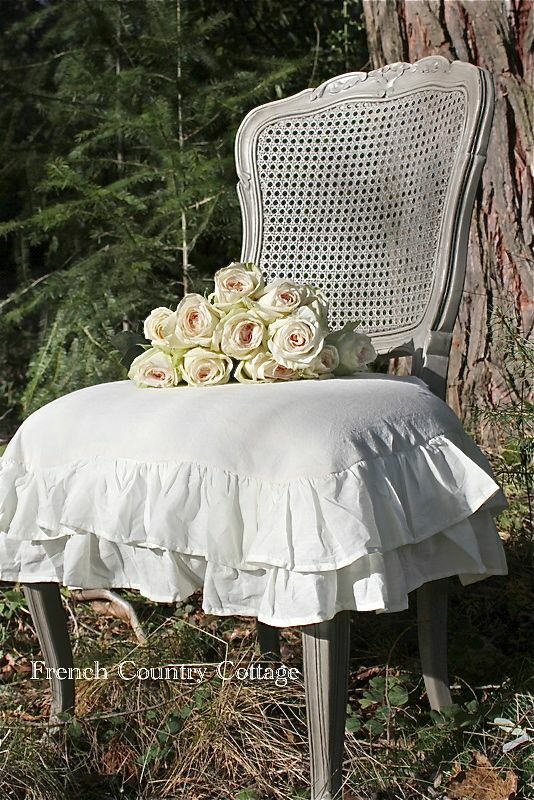 The ruffles work beautifully with the chair, and roses are always an added bonus. Love the whole vignette. Your chairs are gorgeous, love the ruffle seat covers you made for them......just lovely! So cute, so romantic! Perfect for the season! It is fabulous! Wonderful job! Gorgeous, Courtney! I always drool when I see slips or other coverings for chairs like this. You did a great job and I love how the back looks, too. You may not need to bring your staple gun out at all for these! I am a slipcover junkie, and these have given me my fix! Love the ruffles and the way it drapes over the seat - beautiful! What kind of fabric did you use? I'd love it if you'd share this at my Show & Tell linkup party and giveaway going on now @ the Delectable Home. So, so tres chic! You are very talented! 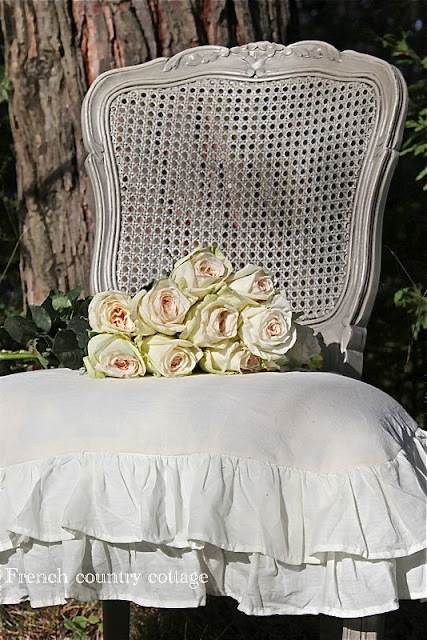 The chair looks great..I cannot imagine it with an iKat print..Oh, and those roses are magnificent! So perfect! I LOVE everything you do!! And the roses are beautiful.. I too find them calling my name when I see them at the store! Oh they're glorious with the two ruffled slipcovers... and those photos with the roses are incredible. What a visual treat! I'd love to have some chairs exactly like yours! So pretty! I love the ruffled slip! Hi there, your ruffled slipcovers are so beautiful! I am an amateur at sewing and made a valiant effort sewing chair slips but had to give up because I became very confused! Anyway, I tip my hat to you. I ended up buing 4 slips at 30 bucks a piece thru a website I found thru Romantic Homes magazine. Do you sell yours anywhere? Just thought Id'd ask. So lovely with the ruffles. 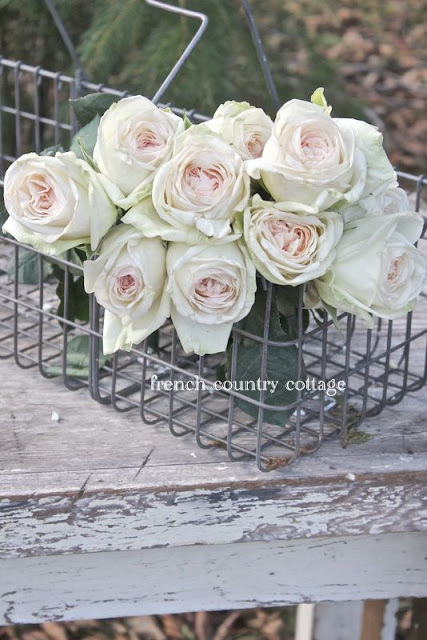 Beautiful how you styled the French chair with the beautiful roses. Simply elegant! My two favorite things...ruffles and roses! Just gorgeous!!!!! Love, love, Love your Frenchy chairs and their beautiful ruffly skirts...you did an amazing job!! So excited to have found your beautiful blog and happy to say I'm your newest follower! I just love the ruffled chair cover. I have to ask, how did you do the part that goes around the back of the chair, and how does it stay together. I would love to make one of these but that part stumps me. Beautiful roses too. Wow do they look great! You are the ruffle queen, Courtney! Such pretty roses too. wow, was für schöne Impressionen von dem Stuhl - das gefällt mir richtig gut! Courtney, I love your photographs, so romantic. Yep, I am loving them too! so very pretty. What a great job. Beautiful photos ~ one can NEVER go wrong with roses & ruffles! Your ruffled chair slip is gorgeous!!! I'm considering doing that type of slip for my parson chairs. They would not look so stern and masculine. Those are beautiful, Someday I want to recover some of mine, will use yours as inspiration! 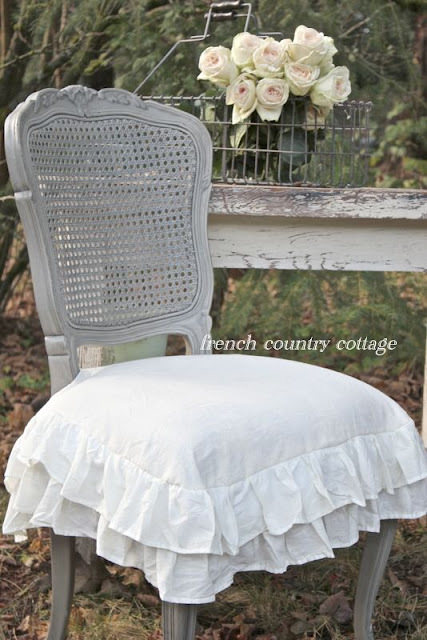 I have a chair in need of a new dressing and I love the double ruffle, great inspiration. So charming and romantic! Thank you for sharing your lovely post at Potpourri Friday! Such yummy ruffle goodness! I could think of a lot of places to put a chair like that in my home. Well done! Thanks so much for linking up to my first Room Evolution party! I look forward to seeing more! So your are the ruffles and roses girl! I LOVE love love love these chairs and covers. Oh btw did I tell you I love them. I'm not a girl girl so having ruffles on my furniture is the perfect place to put them. You take some beautiful photos also. Love your blog, PS now following you. I was thrill that you shared your creative inspiration over at Sunday's Best. I'm now headed off to join yours. Looks beautiful! 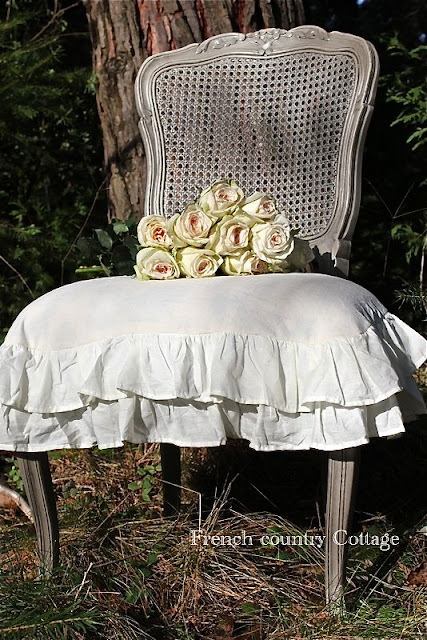 Perfect chair for the ruffles too! Thank you for joining me at Home Sweet Home!